FLAGSTAFF, Ariz. — Did you know that Arizona is visited by more than 200 bald eagles during the winter? To learn more about these amazing birds, and to see live eagles, the public is invited to attend the annual Bald Eagle Celebration on Saturday, Jan. 27, at the Willow Bend Environmental Educational Center, 703 E. Sawmill Road, in Flagstaff. Several programs will be offered during this year’s event, which is hosted by the Arizona Game and Fish Department, Willow Bend Environmental Education Center, and the Arizona Watchable Wildlife Experience (AWWE). The cost is $10 per participant for each program, or free for Willow Bend Members. All programs, except field trip, will be conducted at Willow Bend. The day will also include an opportunity to see live bald eagles up close and a chance to talk with dedicated individuals from Liberty Wildlife Rehabilitation Foundation. 8-10 a.m. – “Early Birds” Field Trip: Join wildlife biologists for an early-morning field trip searching for wild bald eagles and local waterfowl around Lower Lake Mary, south of Flagstaff. The meeting location will be provided when you register. Personal transport is required and carpooling is encouraged. In case of inclement weather, field trip will be cancelled. 10-11 a.m. – “Eaglets” Family Presentation: A family-focused, interactive program especially designed for families with young children (ages 4-12). 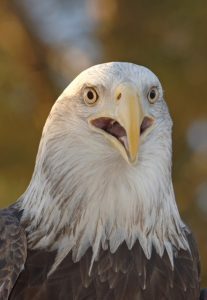 Learn about and view live eagles. 11:30 a.m. – 12:30 p.m. – “First Flight” Community Presentation 1: Learn about the incredible bald eagle from a Game and Fish biologist, and view live eagles up close. The presentation is open to all ages. Please note this is the same presentation as the 1 p.m. session. Please only sign up for one presentation. 1-2 p.m. – “Fully Fledged” Community Presentation 2: Learn about the incredible bald eagle from a Game and Fish biologist, and view live eagles up close. The presentation is open to all ages. To register for one of the programs offered or for more information, visit www.willowbendcenter.org.